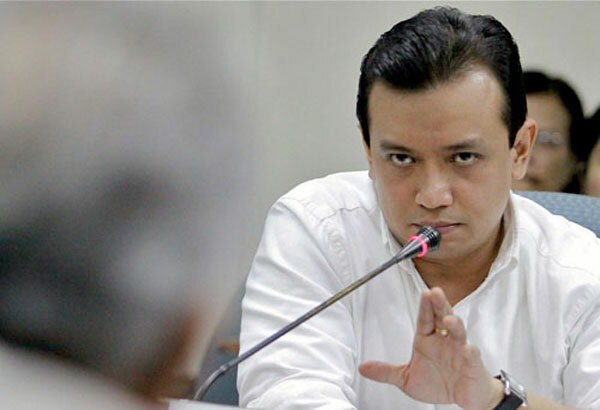 MANILA, Philippines – An arrest warrant is set to be served against Senator Antonio Trillanes IV after a Makati court found probable cause in the libel case filed by dismissed Mayor Jejomar Erwin "Junjun" Binay Jr against the senator. "There is an order of probable cause. If there is an order of probable case, kasunod na po 'yung warrant of arrest (the warrant of arrest follows)," Makati Regional Trial Court (RTC) Branch 142 lawyer Maricel Cairo told Rappler via phone interview on Monday, February 1. Binay filed the libel complaint before the Office of the Makati City Prosecutor on April 13, 2015, the same day Trillanes said two justices of the appellate court's 6th division received a total of P50 million to issue a temporary restraining order and a writ of preliminary injunction stopping the Ombudsman's second preventive suspension against the Makati mayor. In his libel complaint, Binay cited public statements made by Trillanes and quotes attributed to him in a report published in the April 8 issue of the Philippine Daily Inquirer. Trillanes was quoted as saying that the Binays were "part of a syndicate" that has committed various anomalies. "Pinag-aaralan na ng abogado ko kung ano ang mga nararapat na hakbang," said Trillanes in a text message. "Pero kung ang layunin ng pamilya Binay sa kasong ito ay para tigilan ko sila sa aking pag-uusig, nagkakamali sila. Hindi ko hahayaan ang mga magnanakaw na mamuno ng ating bansa." Trillanes, a staunch critic of the Binays, is part of the Senate blue ribbon subcommittee that investigated the corruption allegations against Vice President Jejomar Binay, his son Junjun, and his alleged dummies. The Ombudsman had ordered the younger Binay's dismissal over his alleged involvement in the overpricing of the Makati city hall parking building. VP Binay has been topping voters' preference surveys, while Trillanes continues to lag behind in the polls. Trillanes' legal counsel Reynaldo Robles said the senator will "readily face" the court's ruling. “We have not received our official copy of the investigating prosecutor’s Resolution; but if it is true that she recommended the filing of an Information for libel in court, Sen Trillanes will readily face the charges against him in court," said Robles in a statement. The lawyer said that Trillanes is currently abroad to attend an international forum, but "he will voluntarily submit himself to the jurisdiction of the Honorable Court, if so required." “Needless to state, this is without prejudice to the senator’s right to file a motion for reconsideration or even appeal said resolution to the Department of Justice, if warranted by the circumstances," said Robles. He is also confident that any attempt to intimidate Trillanes will not succeed. "In 2003, Sen Trillanes was jailed for exposing anomalies in the government. I believe he is ready to face any consequence, including facing malicious cases and possible imprisonment, just to let the people know the truth regarding the massive corruption in Makati. This is especially true since Sen Trillanes exposés about corruption are well within the scope of his mandate and his immunity as Senator of the Republic,” said Robles. Binay's lawyer Claro Certeza also has not received an official copy of the court decision, but he welcomed the news. "It vindicates what our client is saying all along that all his [Trillanes] charges and accusations are untrue and politically-motivated," Certeza told Rappler via phone interview. He added that Trillanes, as well as the other witnesses who testified against VP Binay during the Senate probe, resorted to "trial by publicity." With the Makati RTC's ruling, however, Certeza said it proves that the allegations thrown at the Binays "have no basis at all."